When you need to refund, void, or delete a transaction and your QuickBooks Payments account is linked to your company file, it is best to do so within QuickBooks, so that the transaction information integrates with other related data. Credits or refunds are applied to the cardholder's credit card after the batch closes however there may be some additional time before the cardholder see the credit due to the card issuing bank procedures. Voids are applied instantly and do not charge the card however an Authorization Hold may occur due to the card issuing banks procedures. The cardholder will need to contact their bank to remove an Authorization hold of this occurs. Processed on the same Merchant Account/Company Auth ID combination as original sale. Within rolling 6 months of the original transaction. Refund issued to the credit card used on original sale. Refund amount should be for no more than the total amount processed on card. From the QuickBooks Home screen, click the Refunds and Credits icon. In the Customer Credit Memo screen, enter the appropriate customer name and amount to be refunded. In the Available Credit screen that appears, select Give a refund then click OK. 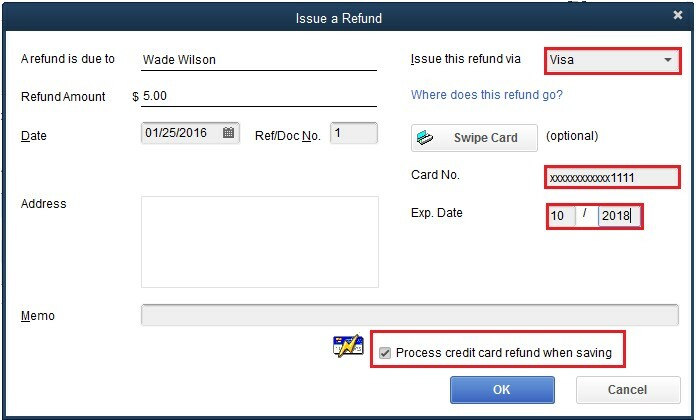 In the Issue a Refund window, select the credit card type to be refunded (Visa, MasterCard, Discover, Amex) and enter the card information. Note: Be sure the Process credit card refund when saving box is checked. Click OK to complete the refund for processing. Important: If adjustments or corrections are needed, contact QuickBooks Support. Go to the Customers menu and click Receive Payments. Note: If you are using sales receipts, go to Customers menu and click Enter Sales Receipts. In the Receive Payments window, Click Find and use appropriate filter to search for the transaction. Go to the Reports tab and click Processed Payment Receipt. Click Void then save the changes. Go to the Customers menu and click Customer Center. In the Customer Center, find the appropriate Credit Card Refund. In the Credit Card Refund window, click the History drop-down arrow and select Processed Refund Receipt.